I know the saying "don't judge a book by its cover" but I can't help but judge a product by it's packaging. Really nice packaging can make a lackluster product seem much better than it is, conversely, a great product with tacky packaging can seem kinda lame. While the most important thing about a product is obviously the formula, the product's packaging is also important. 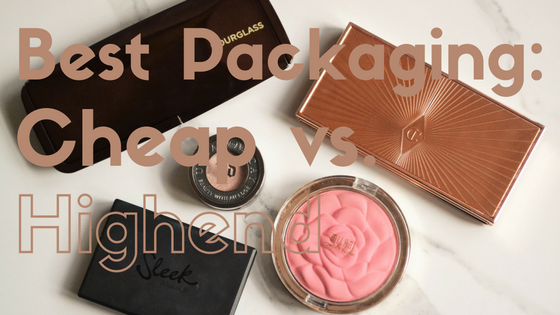 Often times high end products are more expensive in a large part due to very luxurious packaging, but the packaging on inexpensive products can be just as good. Of course this post wouldn't be complete without mentioning the worst packaging too. Charlotte Tilbury is my favourite packaging of all time. It's rose gold and the attention to detail is very impressive. It also feels extremely luxurious and well made. There is quite a bit of weight to it and it doesn't feel like plastic (although I think it probably is). Just looking at it makes me happy. Specifically the packaging on their eyeshadows is beautiful. These are expensive little products at $22 each and I'm pretty sure that's partly due to the ornate packaging.The lid is partially clear so you can see the shadow, but the rest of the lid is very detailed. The packaging is also a dark metallic, almost steel like in colour. I am very much a fan. Hourglass is another luxury brand with beautiful packaging. The colour and unique shape is what I like the best about this packaging. It does feel a little bit more light and plastic than other luxury brands. This is a well named brand because their packaging is quite sleek. It's very thin and black but feels very sturdy and well made. Plus there is a quality mirror included in the palettes. Glass products from drugstore brands automatically make them feel more luxurious and the brushed glass and matte lid on this Sonia Kashuk concealer makes it look like a highend product. Now the actual packaging on this one is very minimalist. It's just a clear lid with a gold base but the flower imprint on the product is what makes this so special to me. I think this is such a unique and beautiful way to package your product. I just love it. Now to be fair this was a limited edition Christmas release so I'm not going to be too hard on them but this packaging is so clunky and hard to store. Plus I'm not a huge fan of looking at the Christmas theme in August. However I did get 5 blushes, a bronzer and a highlight for the price of one regular sized blush, so I can live with the terrible packaging. As you can tell I favour packaging that looks very sleek and pretty. There are other brands that have really cute and fun packaging (i.e. Too Faced, Benefit, theBalm) that didn't make my cut. What Brands do you think have the best packaging?